As a lifelong resident of Hyde Park and a member of the Dutchess County Legislature, Will's focus is centered on enhancing the lives of all Dutchess County families, workers, and residents. He knows that a less intrusive government and a decreased burden on taxpayers strengthens our community. 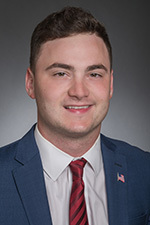 Will is a graduate from Marist College, where he obtained his Bachelor's Degree in Business Administration with a concentration in Finance. During his four years of study at Marist, Will also obtained minors in both Accounting and Economics. As a dedicated Christian and a member of the Hyde Park Baptist Church, Will believes that community service is essential to strong and prosperous leadership.